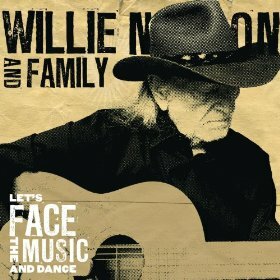 The sweet, slow salsa of lilting piano and that infamous gut string acoustic and talking vocal of Willie Nelson take on Irving Berlin’s “Let’s Face The Music And Dance,” the opener and title track of Willie Nelson’s latest. The truly killer “Is The Better Part Over” follows, which is the only Willie song here, actually (from his 1989 album, A Horse Called Music album) featuring a mournful harmonica behind a sad lyric and strummed acoustic. “You’ll Never Know” features Willie’s sister Bobbie’s piano playing. (Most of the very simple productions here do.) This album focuses on songs Willie and Bobbie played during their childhood and their musical journey together through many decades. There is a redo of Django Reinhart’s instrumental, “Vous Et Moi,” Carl Perkins’ “Matchbox,” “I’ll Keep On Loving You,” and “Shame On You,” which, to a greater or lesser degree, all roll and chunk along. They are nice, upbeat numbers that feature the upright bass of Kevin Smith, Mickey Raphael on harmonica, drumming by Paul English, Jim “Moose” Brown on organ and Willie and his sister Bobbie, or “The Family” as they are known. Bobbie makes the famous “Twilight Time” her own, one of the true highlights here. Let’s Face the Music and Dance is as much her album as Willie’s, really. This second of Willie’s records for Legacy Recordings is simple goodness of standards from a master.